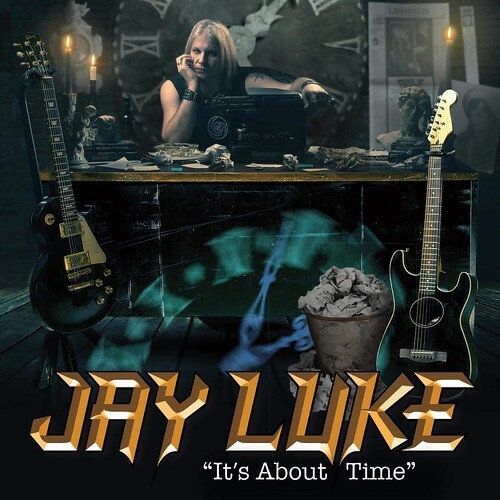 After 15 years and hundreds of live performances under his belt, we think it’s about time for Throop singer/songwriter Jay Luke to release his first solo album. He couldn’t agree more. Over the years, the 39-year-old artist has been making music with his band The MESS, Sorrowsun, and Social Distortion tribute band Reach for the Sky, hosting an award-winning open mic at the Irish Wolf Pub in downtown Scranton, and opening for major acts like Duff McKagan of Guns N’ Roses, Joey Belladonna of Anthrax, W.A.S.P., Metal Church, and To/Die/For. He’s also one of the nicest guys in the local music scene, helping fellow artists while organizing benefit shows and paying his dues. 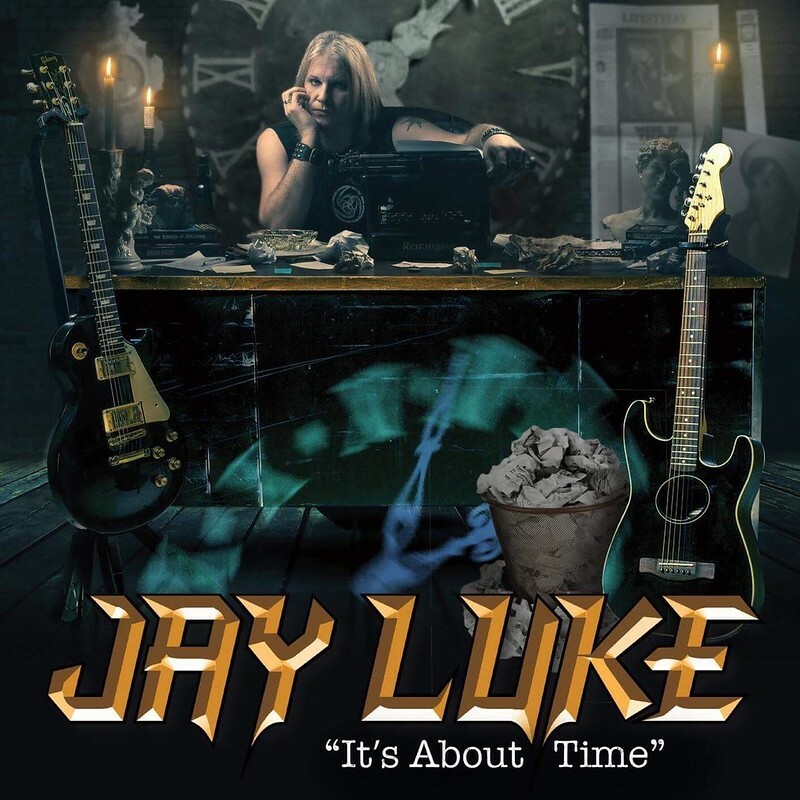 He’s cashing all that goodwill in with “It’s About Time,” his aptly named debut album featuring a who’s who of talented local musicians collaborating on 10 original songs recorded at JL Studios in Olyphant throughout 2017. “It is kind of funny that the title of the album, the artwork, and even most of the songs are autobiographical. I have been performing live since 2003 with the full intention of making an album per year, as I have been writing songs constantly. But then I realized the curse of most musicians and collaborations… that when you need to depend on other people, there is a whole other element that is entirely out of your hands. It is often like being in a marriage with three or four other people when everyone is reaching for the steering wheel. So while we attempted many recordings, we would always lose a band member at a critical time, so the recordings would never see the light of day, unfortunately,” Luke told NEPA Scene. The album is available starting today on iTunes, Apple Music, Amazon, Spotify, iHeartRadio, and CD Baby, with physical copies featuring photography and artwork by Chad Bonk of Storyteller Photography also available at his upcoming gigs. “I’d encourage people to buy the physical disc, as a lot of work went into the artwork and packaging, but sadly I know it is a dying art form and everyone lives in a digital world. But personally, I always like to hold the booklet and read the lyrics for all my favorite albums. Hopefully, that is something others are into as well. Either way, I just hope people listen,” he said. To celebrate his anticipated release, Luke is premiering his brand new music video for the single “Side Effects” exclusively on NEPA Scene, along with some behind-the-scenes videos with outtakes. He also took the time to discuss the video, which tackles a serious topic with some funny, satirical visuals produced by Chris Balton in Scranton in late 2017 and early 2018, as well as his musical career thus far and the storied creation of this very personal record in the following interview. NEPA SCENE: What made you get started in music in the first place? So I sort of stepped away and just remained an avid rock ‘n’ roll fan until I was about 14, when I bought myself a beat-up electric guitar. I began teaching myself how to play while listening to my favorite cassettes and felt things out until they sounded right and I discovered the proper notes. I suppose at the time I felt that if someone else had taught me, I would be corrupted by their style. I know it is probably the opposite of how most people learn, but I wanted to learn the hardest things possible before old fashioned chords and songs. Somehow, it worked out for me. My musical career as a performing artist began in 2003. Before then, I was just sort of playing songs here and there for friends but, in 2003, I played my first live gig in my band The MESS. Since then, I have never looked back. I think I have done one or two gigs a week since that first moment onstage. NS: How would you describe your sound on this album? JL: I think this album is pretty much me putting every influence or style I liked into a blender. It’s got heavy songs, punk songs, slower songs, and some songs where I stepped out of my comfort zone of guitar tunings and things like that. So it isn’t all metal or all punk but a mix of all things I am into. I didn’t want to paint myself into a corner on any one particular style. NS: What is this particular song, “Side Effects,” about? JL: I have been a career insomniac for as long as I care to remember, and often, when it is about 3 a.m. or so, you tend to notice most television channels stop showing content and only air infomercials for these nonsense “wonder drugs.” They show people with creepy, huge smiles over their latest erectile dysfunction pill. There was one for a drug called Enzyte with this reoccurring character named Bob that just haunted me for about 15 years. At the end of all these commercials, there’s a voice like an auctioneer on steroids rattling off the ridiculous side effects in three seconds where they were entirely incoherent. Then usually in a month or less, you’ll see commercials of law firms saying if you ever took any of these magic drugs, you might be eligible for a lawsuit where you’d be able to sue for damages and things like that. It amazed me that in some commercials they would literally put on the screen “We are not entirely sure how this drug works.” That always blew my mind. People ate it up though; the power of suggestion gets the best of them during the vampire hours, I guess. So I just had enough and grabbed my guitar and a pen to sort of write an anti-infomercial drug anthem about it. NS: What was the video shoot like? JL: The video shoot was an experience I cannot even properly put into words. The video was quite elaborate; I played a ton of characters, so there was a lot of changes and quick shots that had to be done. Chris and Mary of chrisbalton.com were so cool to work with. They brought the ridiculous vision in my head to life perfectly. The makeup artist Keiera Kisel also has to be noted, as she did an amazing job making me look the way I did for each character. The time everyone put into it was extensive, but I had one of the best teams ever. We all became very close because of it, and I’d work with them all again tomorrow. NS: What made you want to go in a humorous direction with the video? JL: The concept really came out of a real life thing… Me watching TV late at night in full insomnia mode, and as I looked into the screen, I sort of hallucinated that as I watched each absurd infomercial that I saw myself in them. It mixes a humor to it all when the topic of our country’s addictions to medications and drugs are obviously very serious. I wanted it to be funny and memorable but also a reminder with the lyrics that you have to be careful out there in what you trust to heal you, because it may actually be what can kill you. Something we all found very funny was that, while researching old infomercials and wanting to parody them, some were so insanely ridiculous I’m not quite sure we could ever truly outdo them. When you have the balls to say on your drug advertisement “We are not entirely sure how this works,” I mean, that is as scary as it gets, you know what I mean? NS: Have you ever shot a music video like this before? JL: Honestly, this was my first music video. I appeared in a few before, but this was the first one that was all my own. I was completely new to each aspect of it. I loved learning all the intricacies of what goes on behind the scenes. Hard work for sure. I don’t imagine my future videos will require so much of me, as far as playing 13 characters both male and female. We had a lot of fun and laughs, but the hours were long and, in a way, I think my insomnia sort of helped with all of that. NS: Is this song representative of what people can expect on the rest of the album? JL: I think they are all a bit different in style, but this song has a nice bit of everything. There are cool rhythms, strong hooks, a ripping guitar solo by Stephen Dupak, and serious lyrics with a wicked humor about them. When I let people listen to the recordings, this is the one that people tend to remember. I thought if I were to do a video, this would be the one. NS: Who worked on recording this album with you? JL: The biggest credit goes to Joe Loftus, the producer of the album. Joe and his partner, Jay Preston, made recording such a pleasure, and the speed in which we got things done was amazing. I would go in and record the skeleton of each song with my guitar parts and vocals, Joe played bass on mostly each track, aside from one where my friend Slug took on bass duty for a song in tribute to Walter Prez, as he was a member of Walt’s band until he passed away. For that song, “One for Walt,” I tried to get key people involved in my deceased friend’s life and wrote the lyrics to the song with references to nearly every song title he ever used on his catalog of albums. I got Anthony Turco, who was a member of Walt’s band, and also Carl Canedy, of legendary metal band The Rods, to play drums. Carl was one of Walt’s favorite drummers, so it was very special to me that he was kind enough to perform on it. My philosophy was pretty much to get my favorite guitarists to come in and do little parts or solos when I could get them. I was fortunate enough to get the guitar giants of the NEPA scene, such as Charles Russello, Butch Frable, and Stephen Dupak, to come in, and they all performed incredibly. I also got my friend Candi Vee to do some background vocals and longtime buddy Adam Kotch to come do his first-ever recording, which was really cool. But out of everyone on the album, I got one of my lifelong guitar heroes named Adam Bomb to lay down a blistering solo on a song called “Bukowski” about the famous author Charles Bukowski. Adam has performed with John Paul Jones of Led Zeppelin, Mick Taylor of the Rolling Stones, and was the guitarist on my favorite album by Hanoi Rocks frontman Michael Monroe. If you know me, you know I cannot let a minute pass by without spouting my mouth off about Hanoi Rocks. It was a huge thing for me that Adam appeared on the album. NS: What are your plans for the new release going forward? JL: I honestly have been so focused on getting everything finished that, for the release, I may have a listening party somewhere. But I haven’t planned out the when or where just yet. I mainly want to have the music out there for the people that have been following me for so long to finally hear. I have so many people overseas that always ask when they can hear my music, and I am really looking forward to them all getting the chance to catch this album. From Finland to the U.K., I have been blessed with a great network of people that never seem to give up on me, so for them to hear it will be really cool. I have been waiting so long that I likened it to being pregnant with this baby that has been kicking and screaming for a way out, so going forward after this will be business as usual, I think. I already have many ideas for getting a second album started, so once the promotion and reception of these songs are absorbed, I think l will get right back on the horse and go to work playing shows and continuing with writing music. JL: I just want to again acknowledge everyone involved in the making of this album and the making of the video for their hard work. Joe Loftus, Jay Preston, Stephen Dupak, Adam Bomb, Charles Russello, Butch Frable, Adam Kotch, Slug, Anthony Turco, Carl Canedy, Candi Vee, Chris and Mary from chrisbalton.com, Keiera Kisel, Paul Davies, Chris Granza, Chad Bonk, and anyone else I missed; I apologize, as it has been a long ride with many sleepless evenings. I want to thank the people that have never stopped coming out to my gigs after all these years, and to those fans overseas that have been ultra patient in me getting things prepared for release – I truly hope you won’t be disappointed. And I would also like to thank you personally, Rich, for taking the time to premiere this for me, because I am never the sort of guy that gets asked to do much as far as events and things like that. I am a DIY guy, and you have been flying the flag for area artists like no one else. I think we all owe a large debt to what you do and for how you promote everyone who is out there doing their own thing. It does not go unnoticed.